To-may-to vs. to-mah-to, fruit vs. vegetable. What drama surrounding such unassuming, delightful little comestibles! No matter how you say the name (personally, I'm partial to the term 'maters) or what type of food they are (a berry, for the record), I love 'em. I love 'em in salad, as salsa or pasta sauce, on a sandwich--I'll take them however I can get them. 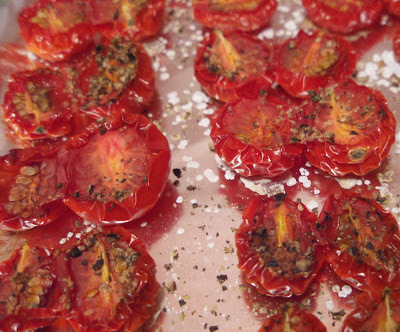 I used to think that my favorite type of tomato was sun-dried. That lurvely sweet and tart punch really does it for me. 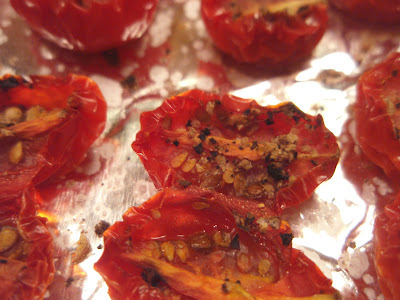 However, there seems to be some stiff competition emerging in the form of oven-dried 'maters. Grape tomatoes were on sale at the grocery store, so I got a couple pints. I sliced them in half, liberally added salt and pepper (freshly-ground, of course), and popped them in the oven for an hour at 225 degrees F. Then I turned the heat off and let them dry up overnight. Yes, the concentrated flavor is fabulous. Sweet + tart + salty + spicy = incredible. But what makes these little morsels so delectable and irresistible is the burst of juice that you get when you chomp down on one...if you don't dry them to oblivion. I'm not kidding when I say that I eat them like candy. They're a primo snack, and I'm sure they'd be great with pasta or in a salad or whatever else strikes your fancy. Tommy-toes can do no wrong! 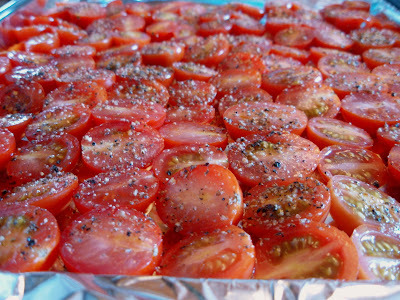 I adore tomatoes, no matter how they are prepared!! These look so delicious! I love tomatoes. Especially fresh from NJ in the summer. Oh so good. I've never tried oven-dried, though. I'm intrigued. I might give it a shot. I don't care for sun-dried. I do love fresh tomatoes in capresa. Yummy!! I love tomatoes too. Your looks great! Another good one to try! Oh you're putting me in the mood with these babies....beautiful, beautiful photos! Hmm, this is interesting. I love sun dried tomatoes, so I'll have to try this. This would be great in the summer when you have all those tomatoes from the garden. I'm most certainly going to try this. It's my favourite ingredient to use when making sauces and we use it all the time. You peaked my curiousity big time...starred. 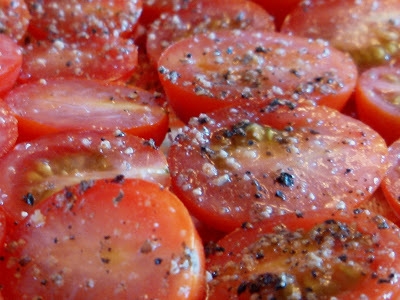 Give me a good movie and a plate of those scrumptious oven dried tomatoes and I'm a happy camper. Who needs popcorn. They look great! What a great idea! I have roasted those little guys before, but never tried to dry them myself. They look beautiful! Oh, who cares about what they are. Just gimme more! :-) ha! Just kidding. Well, not about giving me more. These look great. A simple, tasty treat. The vegetarian/vegan restaurant I cook at does something similar but we add breadcrumb and parmesan then serve on pasta with olive oil and fresh basil. these look great! i'm inspired!